Edge, the new web browser from Microsoft is the default web browser as well as the default PDF reader in Windows 10. While the current version of Edge lacks several features offered by its rivals like Mozilla Firefox and the popular Google Chrome browser, several benchmark tests have confirmed that Edge is comparable to other third-party browses as far as the speed is concerned. Like other browsers around, Edge also offers you save your web passwords. 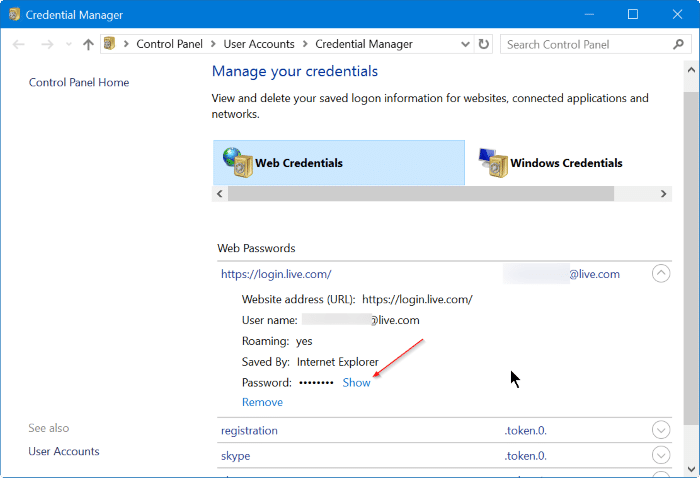 Passwords saved in Edge browser can be managed by opening the advanced settings of Edge. As said before, Edge browser still far from perfect. Many users who have been using Edge as their default web browser have complained that the browser doesn’t open at all, at times. 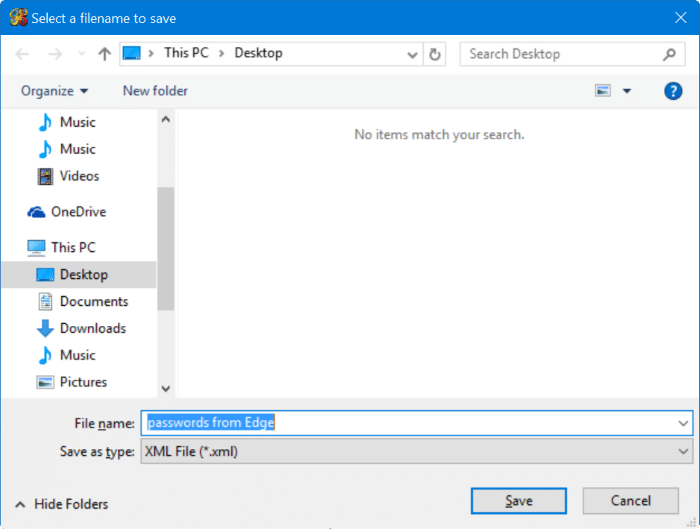 If you have saved your web passwords in the Edge browser and the Edge browser is refusing to open for some reason, you can follow the given below directions to recover passwords saved in the Edge browser in Windows 10. 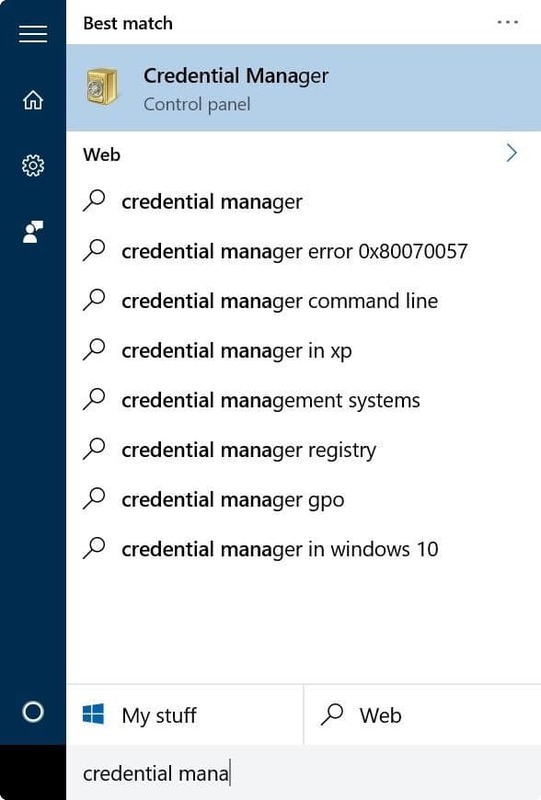 Step 1: Type Credential Manager in Start menu or taskbar search box, and then press Enter key to open the same. 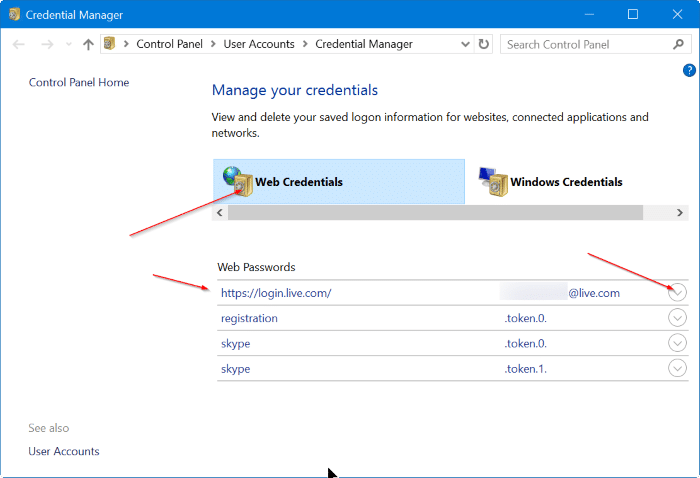 Step 2: Click on Web Credentials to view all passwords and usernames saved in Edge as well as in Internet Explorer. Step 3: To view a password for a website, click the down-arrow next to a web link, and then click Show link next to the Password. 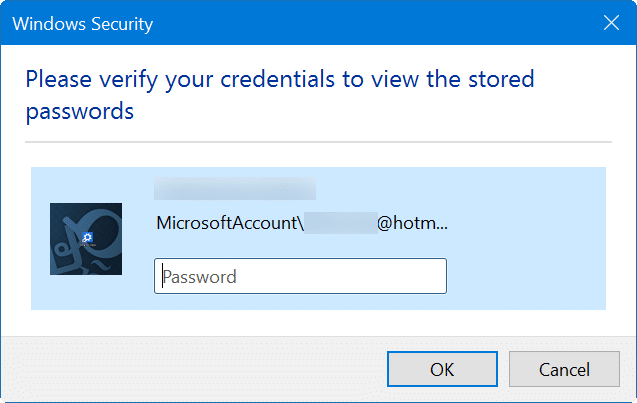 Step 4: When you are asked to enter your Microsoft or local user account password, enter the same to view the password for the selected web address. 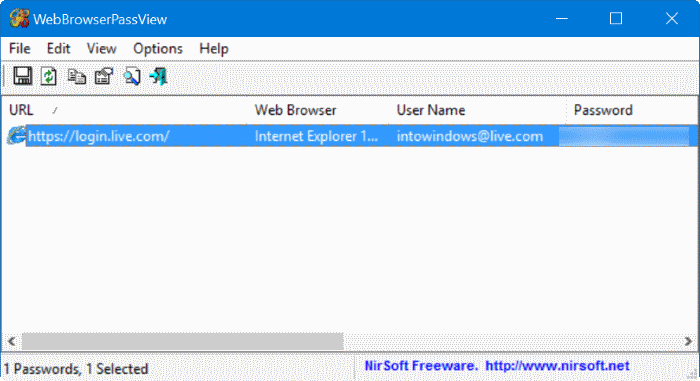 Step 1: The first step is to download a free tool called WebBrowserPassView from NirSoft. In addition to the regular installer, the software is available in portable version as well. If don’t want to install this software on your PC, you can download only the standalone version by clicking Download WebBrowserPassView (In zip File) link. For those who are concerned about using a third-party tool to recover passwords, NirSoft is a very well- known developer and all of their tools are safe to use. 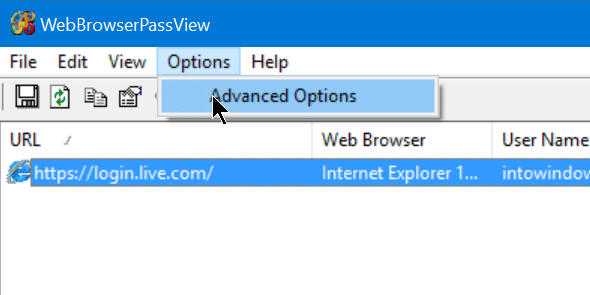 Step 2: Extract the downloaded zip file to get WebBrowserPassView.exe file. Double-click on the file to run WebBrowserPassView software. Step 3: With default settings, the tool automatically shows passwords saved in all installed web browsers on your PC. For instance, if you have saved passwords in Opera, Chrome, Firefox, and Edge, the WebBrowserPassView will show passwords saved in all these browsers. 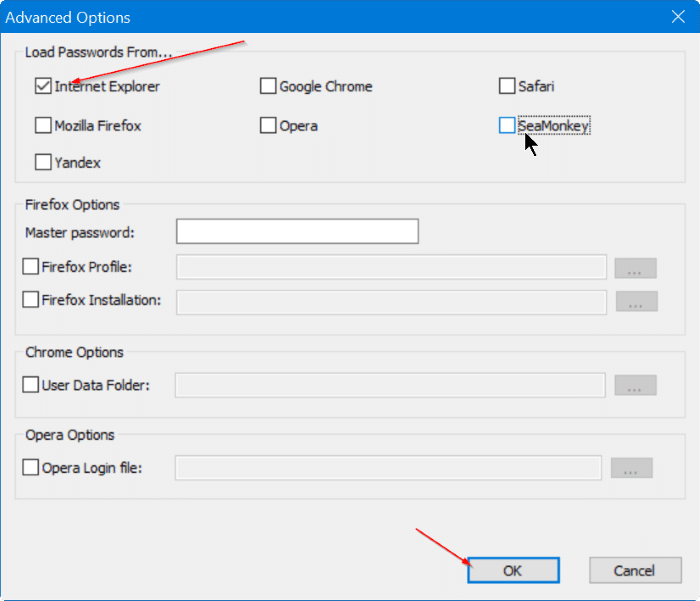 To view passwords saved only in Internet Explorer and Edge browsers, click Options menu, click Advanced Options, uncheck all browsers except Internet Explorer and then click OK button. 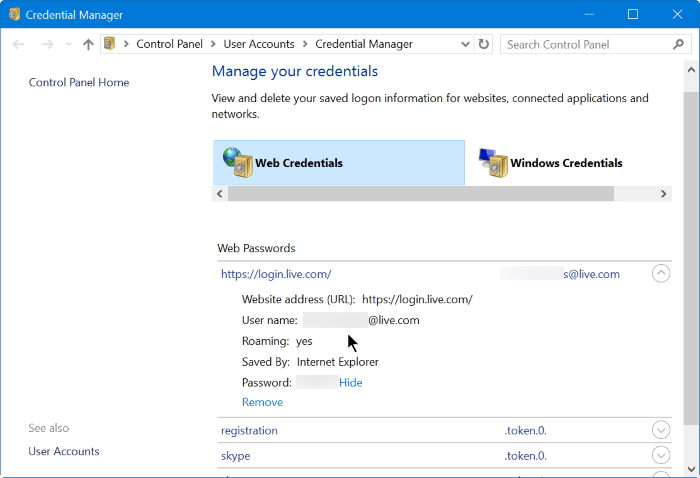 As passwords saved in both Edge and Internet Explorer are stored in Credential Manager, the tool recognizes Edge browser as Internet Explorer. The WebBrowserPassView supports exporting passwords saved in the Edge browser to text file (.txt), HTML, CSV, or XML file types. Are you using Edge as your default browser in Windows 10? And how do I restore them, say on a different machine?